A linear walk from Buckden in Wharfedale to Bainbridge in Wensleydale to celebrate the 80th anniversary of Alfred Wainwright’s Pennine Journey in 1938. In 1938 Alfred Wainwright undertook a walking holiday in the Pennines. His route took him from Settle to Hadrian’s Wall and back again via a different route. He wrote a book about what he called his ‘Pennine Journey’ which remained for a long time forgotten and unpublished. By the time it saw the light of day in 1986 Wainwright had become celebrated for his numerous illustrated guides to his beloved Lakeland Fells. ‘A Pennine Journey’ is a fascinating read, not only for its descriptions of life in the Pennine villages that Wainwright passed through but also because of the shadow of war hanging over the whole work. In 1998 David and Heather Pitt set off to try and recreate as much of the route as possible and this became the basis of the creation of the ‘Pennine Journey’ long distance walk, a guidebook for which was published in 2010. You can find out more about the walk and the history behind it on the Pennine Journey website. 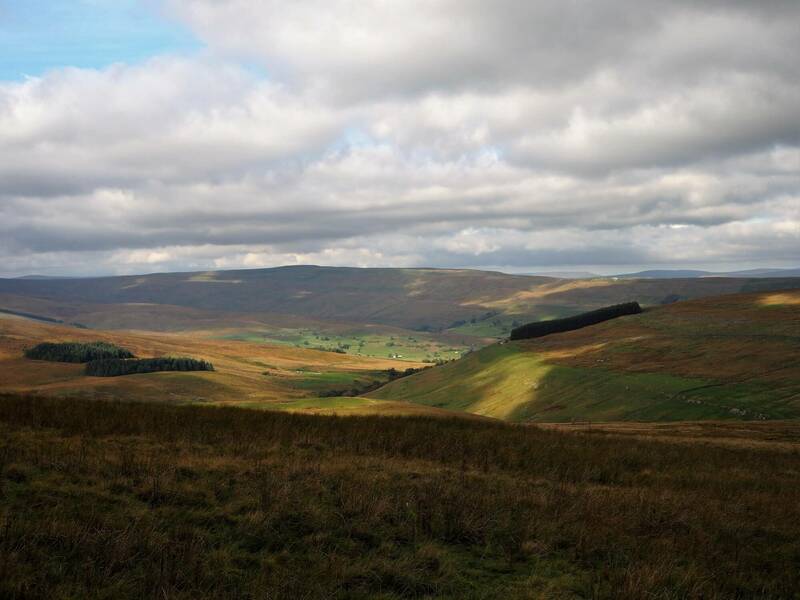 To mark the 80th anniversary of Wainwright’s walk, David was keen to organise a ‘Pennine Journey in a Day’ event which would see walkers tackle different stages of the walk at the same time. I was contacted by David via a mutual friend on Facebook and was asked if I’d be interested in doing the Buckden to Bainbridge route. I was keen but the obvious problem facing me was the logistics of getting back to Bainbridge. This problem was solved when my friend Paul said he’d be happy to do the walk with me thus allowing us to use two cars. So it was that Paul and I met up in Bainbridge where we left his car and drove in mine to Buckden. Parking at the main car park in the village it was thus a simple case of walking the ten miles back to Bainbridge via a route that would take us from Wharfedale into Wensleydale via Stake Moss and Raydale. It should be noted that on the second day of his journey the indefatigable Wainwright actually walked from Buckden to Muker. In other words we were only walking just over half the distance that he did! From the car park we took the slanting path up to Rakes Wood which is often used as a prelude to an ascent of Buckden Pike. Before we’d even reached the fringes of the small wood there were already some lovely views back down to Buckden. Passing through the woods the path turned to the right. Ignoring the turn off leading up to Buckden Pike we continued on a grassy shelf above Cray Gill. Along this stretch we were treated to views of Langstrothdale, Yockenthwaite Moor and our route up to the top of the Kidstones Pass. Shortly before reaching Cray High Bridge I resisted the temptation to make a detour to visit Cow Close Falls. One of my favourite waterfalls in the Dales I’d been to the waterfall in the middle of August as part of my Wharfedale Waterfalls walk. We did still get a view of the falls though and were amused to see that the strong breeze was blowing the top of the waterfall back on itself. From Cray High Bridge it was then a short steep climb up to the top of the Kidstones Pass, or the Cote de Cray as it became known during the 2014 Tour de France. Not long after the road flattens out there is a bend in the road to the right where a track continues straight on. This is Gilbert Lane and here we left the road to begin our climb up on to Stake Moss. Again I was retracing some fairly recent steps as I’d been up this way only two weeks before when I’d gone in search of the waterfalls of Back Gill. This section over Stake Moss inspired Wainwright to wax lyrical: “Oh, how can I put into words the joys of a walk over country such as this; the scenes that delight the eyes, the blessed peace of mind, the sheer exuberance which fills your soul as you tread the firm turf?” It is interesting to note that what is now a firm stone track was a grass path back in 1938. In truth the flat section on Stake Moss was the least interesting part of the walk. It was, however, a necessary preliminary for a superb descent into Cragdale and Raydale. This part of the walk deserves all the flowery prose that could be written about it. From the first appearance of Drumaldrace and the valley of Raydale below it truly is a succession of delights. The views were enhanced by the autumnal colours and the patches of sunlight sliding across the valley. Part of the way down we stopped below a small bridge over Shaw Gate Gill to have an early lunch. It also gave me time to take some photos of a couple of pleasant little waterfalls. Continuing on after lunch we enjoyed some glorious views down to our left into the lonely valley of Cragdale. The peace of the surroundings was occasionally broken by a partridge shoot that was taking place in the valley. Joining High Lane our route swung northwards a short distance before we left the main track to descend the stony Bob Lane. By coincidence at the top of Bob Lane is a Pennine Journey waymarker. When I came across this particular waymarker back in 2015 it was the first time I realised that the Pennine Journey had been turned into a waymarked walk. At the foot of Bob Lane we turned left into the small village of Stalling Busk. Passing through the village we took a thin path heading down through woods and fields to the remains of the old church of Stalling Busk. Originally built c.1722 it fell into disuse when a new church was built in the village in the early part of the 20th century. Situated about a quarter of a mile below the modern village the ruin is situated in a beautiful spot with a good view of Semer Water. One wonders what his reaction would have been had the resident of Bainbridge not made that fateful assertion. Certainly Semer Water should not be so lightly dismissed. Indeed, the view from the north shore of the lake towards the fells circling Raydale is one of the loveliest spots in the Yorkshire Dales. After lingering a while alongside the ‘flooded field’ we took the path heading upstream from Semer Water Bridge. This follows the River Bain, often quoted as the shortest river in England. Not only is it short but at this point it is a narrow reedy channel. Still this was a pleasant enough section. I was enjoying myself so much I didn’t even panic too much when we had to pass by some cows. Nearing the end of the walk we climbed a pasture which was a strangely bright shade of green. Continuing on we climbed to the brow of Bracken Hill. Here we got, not only a good view down into Wensleydale, but also a grand view back along our route in Raydale. From the top of Bracken Hill it was then a simple descent into Bainbridge and the end of our walk. There was not a step of this walk which was new to me. However, I would have to rate this as one of the best walks that I’ve done this year. Perhaps it was because we had the opportunity to do a linear walk and link together areas that wouldn’t normally be visited together in the constraints of a circular walk. The ever changing views, especially the descent into Raydale were superb. The weather too also played its part. A bright day with a stiff breeze moving the clouds along at a quick pace is just about my perfect walking conditions. So it proved on this walk too.